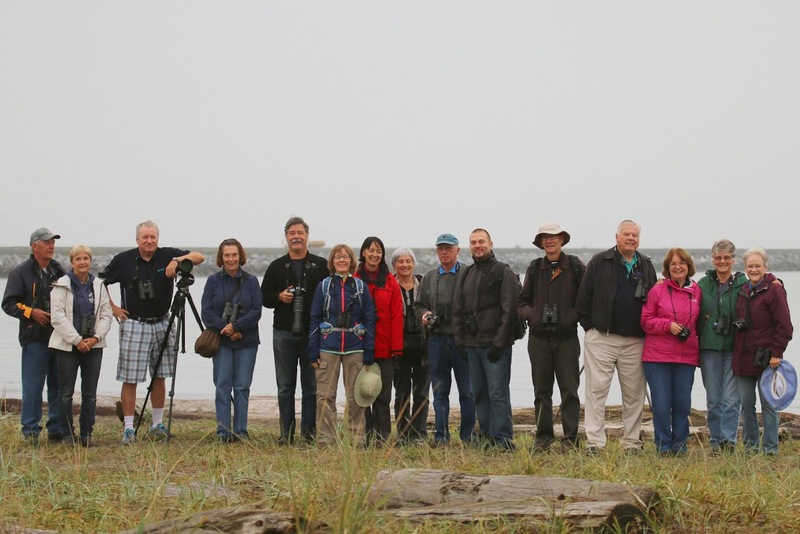 Nineteen DNCBers spent a lovely Fall Wednesday morning of birding at Iona Regional Park. Lots of hi-lites, and some beaut photos by Liz, Marion, Glen, Terry and others expected on our DNCB Picasa site. Rush hour tunnel traffic wasn’t too bad and I got to Iona before 8:00 a.m. where North Delta Jean was waiting. We cased the beach which was loaded with ducks (>1000), interestingly most of which were Red-breasted Mergansers (not similar-looking non-breeding Common Mergansers; ID confirmed after some healthy discussion and analysis). Of course, lots of Northern Pintail, American Wigeons and Mallards were there too, plus a photogenic flock of about 50 Great Blue Herons. A small flock of American Pipits flitted along the beach as Killdeer called around us. Other DNCBers, including the Petra’s group arrived around 8:15 a.m. and the “cackling” started as each of us tried to catch up with long lost friends, many of whom hadn’t seen each other for a whole week. Because they like their names in print, the Petra’s crew included Roger & Mike, our Guru Anne, mushroom expert Glen, Jimmy K and Terry. Other new arrivals were Kirsten, Marion, Pauline, ready-for-work teacher Greg, Richmond Bill, Aussie Nance recently returned from Botswana, Jonathan without Lorraine, loquacious Liz, and a very happy and healthy White Rock Leona. Both Terry and Roger took the obligatory Group Photo here of the 16 of us (time-challenged Richmond Donna, White Rock Alice and garrulous Otto were absent). We moved on to the second pond where MV Park Interpreters were setting up to entertain a class of 7 & 8 year-olds on the wonders of living organisms in the marsh. Lots of House Finches, Spotted Towhees, Northern Flickers and Red-winged Blackbirds around and some heard/saw a Winter Wren. In the pond among the Gadwalls, we found American Coots, a Pied-billed Grebe and two beaut Ring-necked Ducks. Several large V’s of Double-crested Cormorants regularly flew over us heading south; we wondered where they were coming from and where they were going. Of course we also saw V’s of both Snow and Canada Geese often fly by too. On entering the back door to the Sewage Lagoons, in the first pond all the afore-mentioned duck species were there along with five Pectoral Sandpipers pecking in the mud. As we walked around the ponds, lots of LBJ’s (Little Brown Jobs) were on the path and in the shrubs. We identified Song, Savannah, Golden-crowned and Fox Sparrows, and Roger eventually found two of his target bird, Lincoln’s Sparrow (of course no photo evidence). Some saw a Marsh Wren. A Peregrine Falcon made a nice fly-past as did the earlier-seen Sharpie being harassed by Crows. Otto collected his Butternut Squash and Tomato lunch at the “wild garden” on the edge of the north-east pond. We left the Sewage ponds and walked the park’s back trail through the woodlot. The Iona Park trails were wide and well-groomed. As often happens on DNCB outings, various “chat groups” get spread out. The front group ran into a mixed flock of Warblers, but we could only confirm Yellow-rumped Warblers and Kinglets (Golden-crowned). Some saw a Brown Creeper. Approaching the Fraser River, keen-eyed Roger spotted an Anna’s Hummingbird among a flock of Bushtits. As usual, no one else saw it. Several interesting Mushrooms were near the path, and Glen identified some, the names of which I have already forgotten except for the brilliant red Amanitas. More LBJ’s along the river path included American Goldfinches. An adult Bald Eagle posed elegantly on a pylon in the river. We got back to the washroom parking lot around 11:30 a.m. Only Jean brought cookies which were wolfed down in quick fashion. We chatted about the list of Report Authors over the next couple of months, until the Birds on the Bay outing on December 17, while Sandra and I are in Western Australia. Funny how the group got quiet. It was another awesome DNCB outing as I left to play my regular Wednesday Noon hockey. Next Wednesday, October 15, the DNCB outing will Leave Petra’s at 7:30 a.m., meet at the Queen Elizabeth Parking lot by/above the tennis courts around 8:15 a.m., then leave QE Park in time to meet others at VanDusen Park 10:00 a.m., when it opens. (See DNCB Report No. 2013-42 for October 21, 2013 outing.) Check our DNCB Blog for other info and instructions, and earlier brilliant reports (edited by our Webmaster Ken) and photos. This entry was posted in *DNCB, American Pipit, Bald Eagle, Iona, Lincoln’s Sparrow, Long-billed Dowitcher, Pectoral Sandpiper, Peregrine Falcon, Pied-billed Grebe, Sharp-shinned Hawk, Wilson's Snipe. Bookmark the permalink.